Working with numerous pallets each day can be hard work packing, preparing and loading pallets onto the truck can be taxing on the employees. This is especially true if each pallet has be wrapped and secured before being sent out. The wrapping procedure might just be a loose wrap or a heat wrap, but the load must be secured tightly to ensure no damage is done while in transit. The best way to apply this wrap is through the use of a pallet turntable. 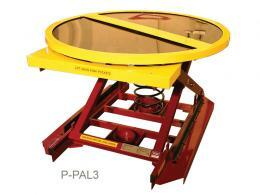 The pallet turntable allows the operator to properly wrap each load. Damage done during transport is a big cause of loss to a business, so proper wrapping procedures must be followed to prevent this from happening. A turntable is a quick way to spin the pallet to be wrapped around with the wrap consistently applied. The pressure and tension can be uniform while the pallet is in the turntable. Each pallet can leave the warehouse with the confidence it’s been handled securely and safely. Every workplace could do with a turntable. They’re an unobtrusive tool to prevent the load from coming unstuck during transport. The sites that will use this the most are the warehouses with a constant supply of pallets to load as well as delivery centres or fulfilment warehouse with a constant flow of receivables and deliverables. The turntable keeps the production line smooth and the pallet secure. There are even powered lifters that can raise a pallet to the height it needs to be for a good wrap job. Workplace Depot offers free-floating options as well as ring turntables. They are easy to operate and install in any floor space. Find out more about how they help you out with your pallet procedures.